My brother brought home a new cellular phone courtesy of Sun Network. 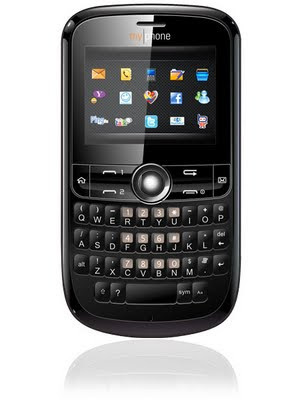 The new phone is the black-colored MyPhone QT7 Duo. According to MyPhone website, the QT7 Duo is a music phone with trackball. MyPhone QT7 Duo costs 2,990 pesos according to the MyPhone website. MyPhone QT7 Duo has qwerty keypad and is a dual sim phone. The screen of MyPhone QT7 Duo is a 240 by 320 pixels 2.2 inches pixels QVGA screen. The phone can connect via bluetooth and USB. According to the MyPhone website, the battery of this phone can last 6 hours talk time and 270 hours standby time. MyPhone QT7 Duo has a card slot for microSD so it can be used in storing photo and music files, specifically MP3 files that can be played by the music player in the phone. MyPhone QT7 Duo also has a 2 megapixels camera located on the back that can be used for taking photos and videos. The phone can also be used as sound recorder and FM radio. Other applications like alarm clock, calculator, e-book reader, calendar etc. that can be found on other phones are also present in MyPhone QT7 Duo. What's unique with MyPhone QT7 Duo or the MyPhone phones in general is that it contains the Pinoy App, which contains files that are distinctly Pinoy. What got my attention is the “My Faith” button inside the Pinoy App that contains prayers, the Rosary, Worship Songs, Mass Songs and other things that are related to the Christian Faith. This is unique because there are few companies out there that aren't afraid Faith in their products and MyPhone is one of those companies. Other Applications available in MyPhone QT7 Duo is the App for Yahoo Messenger, Friendster, Facebook, Multiply, Twitter etc. However, I think that these Apps cannot be used because MyPhone QT7 Duo isn't WiFi enabled. You can only access the Internet through the expensive 3G and GPRS signal, which is not good considering that there are lots of phones out there that are WiFi enabled. At a cost 2,990 pesos, I think that MyPhone QT7 Duo is not a bad buy. However, I believe that it would have been better if it is WiFi enabled. Seems like it is good. But MyPhone QT7 Duo lack WiFi. Thank you for clarification. I forgot about the GPRS functionality of QT7. I will add that to the article now. Ok. I updated the post and included the GPRS. Btw, I already placed 3G signal in the post so your concern dear Len, was already included in my article. hello sorry i have just checked ur blog now...thank u too :) do u have facebook account? Thank you for going back to my blog. I agree with you that some telecom companies have promos for mobile Internet, however they are still expensive as compared to WiFi. I do have a Facebook account. Please give me the link to your Facebook page so I can send you and invitation. im planning to buy a phone and this is one on my list cause i heard a lots of good feedback, is this user-friendly? like nokia and other brand that is easy to use that you don't have to dig deeper to find something.. The MyPhone QT7 that I reviewed on this post is now being used by my father. I observed that my father didn't have a hard time learning how to use this phone. So, I can say that QT7 is user friendly. The Phonebook, Compose Message, and other important applications are on the first page of the menu page. The Setting menu, on the other hand, is located on the second page and I had a hard time looking for it when I am trying to turn the bluetooth on. you forget that it also can serve as a modem for your pc or laptop(parang broadband stick)..
i have QT7 duo and am already using it as a modem.. same charging rate. 5pesos per 15mins. :D sulit na sulit tlga. No Anonymous, I did not forgot to mention that QT7 can be used as a modem. I did not know na pwede pala. There are many cause of DNS errors for your YM in QT7. The cause of the error may come from the Yahoo site, or the telecome network that you are using. I suggest that you visit you telecom provider or the QT7 distributor and ask them about it. hello big guy how can i save file from opera mini to memory card? i have a problem saving pictures to my phone it pops up like saying insufficient memory while my memory space is big ? The myphone qt7 doesnt work abroad. One reason for this problem of Myphone QT7 is that it is a local phone in the Philippines. That is why it might work only in the Philippines. It depends on the operating frequency bands or the network bands that the mobile phone has. So you have to check it to see if it will work in other countries. I didn't experience such problem in MyPhone, thus I have no idea how to solve it. Maybe you can contact MyPhone to help you. I have problem w/ my trackball. How can I fix it? I suggest that you go to a service center of MyPhone to fix the problem of your phone.